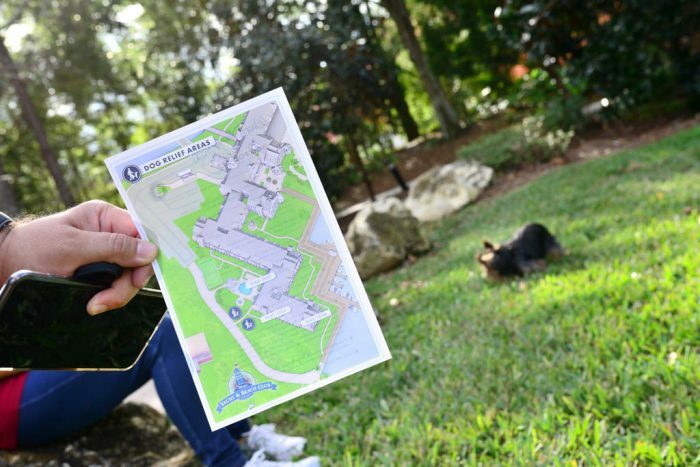 In October 2017, Disney announced that for the first time ever, four of its hotels on property would have dog-friendly rooms. As with just about every announcement Disney makes, the reaction online tended to skew towards “the sky is falling” mentality. 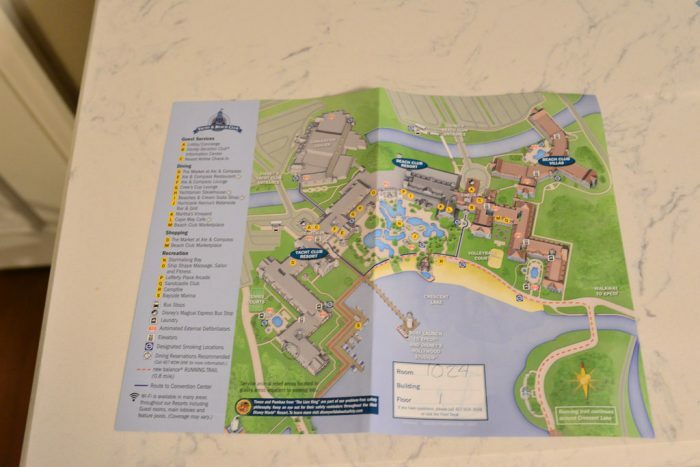 Despite only separated areas at four resorts (Art of Animation, Port Orleans Riverside, the cabins at Fort Wilderness, and the Yacht Club) would accept dogs, you would have thought by the reaction that every Disney hotel at WDW would be turning into a Petco. Even the SATURDAY SIX had a little fun with some of the over-the-top reactions to the announcement. 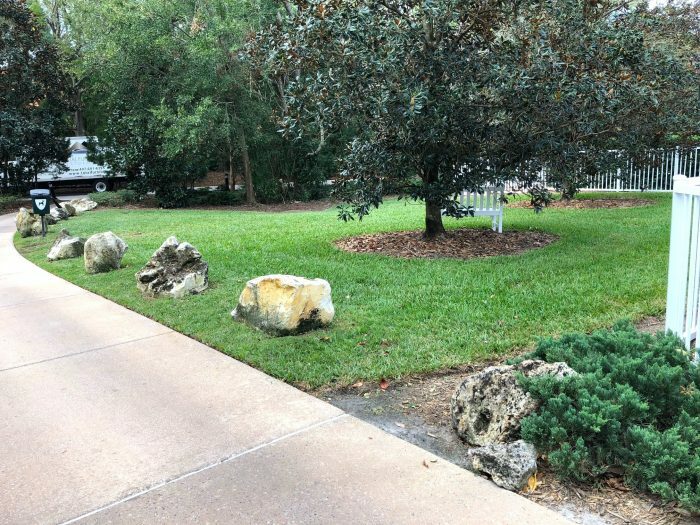 Fun aside, as a pet owner myself, one of the reasons my family has preferred staying onsite at Universal versus Disney over the years is because most of Universal’s properties are pet friendly (only Cabana Bay doesn’t allow animals.) Our dog Sebastian is now 17, and we prefer not to board him anywhere. We decided to use the on-site Best Friends Pet Care to board Sebastian during a family trip in September. While we were more than satisfied with the location, amenities, and staff on Best Friends, we still didn’t like being away from our smallest family member for so long. When Disney made the dog-friendly hotel announcement, we knew it was time to book another trip to The World. Because the dog-friendly policy is so new, I expected there to be a lot of openings at the hotels. In my mind, not many people can adjust their Disney World vacation to include their pet. However, when I went to book the date I wanted, I found out all the dog-friendly rooms were booked. So I tried a different date. Same thing. A third date found the same results. My fourth date option finally had a room available at Disney’s Yacht Club. 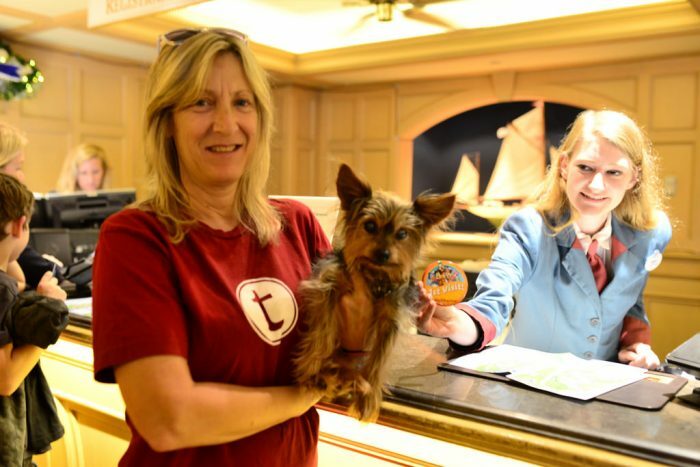 At Universal, the “pet fee” is $50 a night, but that fee is capped at $150 for length of stay. 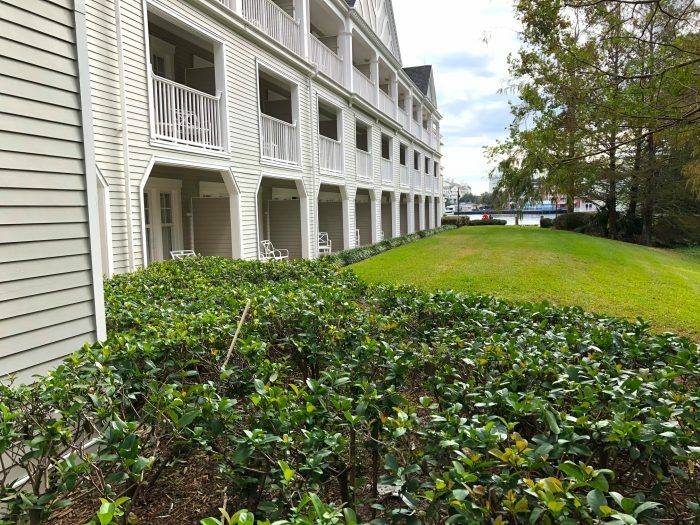 At Disney, the pet fee for AoA, POR, and the cabins at FW is $50 a night, but at Yacht Club it is $75. I do not believe that the price at Disney is capped at any point. With the room booked, it was time for a road trip! Sebastian ready for his first Disney hotel. The weather could not have been better for our trip to Orlando. As a superstitious person, being able to get one of the first couple spots in the Self Parking Lot seemed like a very good sign. While I personally had never stayed at the Yacht Club, I had family from New Hampshire who stayed at the hotel during Hurricane Irma. In fact they stayed an extra three days at the Yacht Club because the Orlando airport closed, keeping them in Florida. When the storm passed, we drove up to spend a day with them at the hotel, and I was defintely impressed. Yacht Club Self Parking Lot. We parked the car and it was time to head in with Sebastian. Normally when I stay at Disney, I just check in early and go enjoy the parks until I get an alert that my room was ready. With Sebastian, that wasn’t an option, so instead I timed our arrival to the hotel at 3PM, hoping that would be late enough for a room to be ready upon check-in. The good news was that a room was immediately ready (I told you that parking spot was lucky.) The Cast Members at the front desk did a great job checking us in fast and getting us all the information we needed to know. First Visit button for Sebastian. 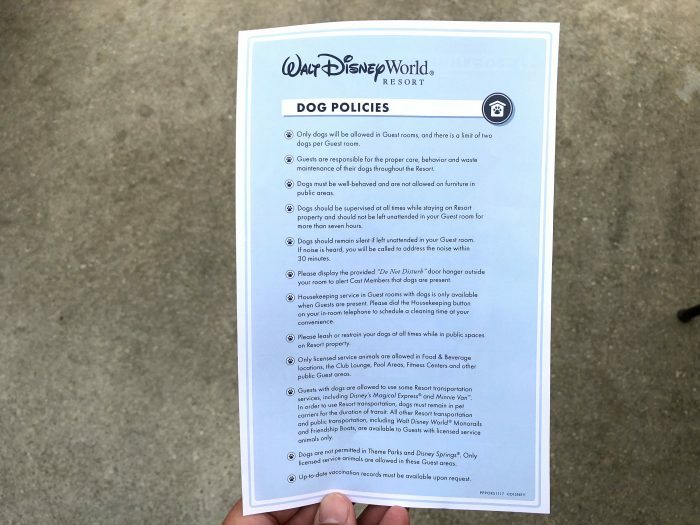 Here are the official dog policies of Walt Disney World. You may have to click on the map below to expand it in order to see the circled area where our room was. It was a surprisingly long walk from the lobby. The only thing even close to our rooms was a quiet pool, so if we wanted to do or see anything at the resort, it took another long walk back to the main hub. Map of the Yacht Club. MagicBands worked, another good sign. We thought the room was fantastic. I’m not exactly sure when these rooms were refurbished, but it couldn’t have been that long ago as everything looked fantastic and there were electrical outlets and USB ports all over the place. Sebastian approved of the beds. Here is a panoramic look at our view from outside the room. While it’s a little hard to see in the picture, we were really close to the Walt Disney World Dolphin hotel. Here is a view of the dog-friendly rooms taken from the side of the building. We were in the third room if you are counting down. 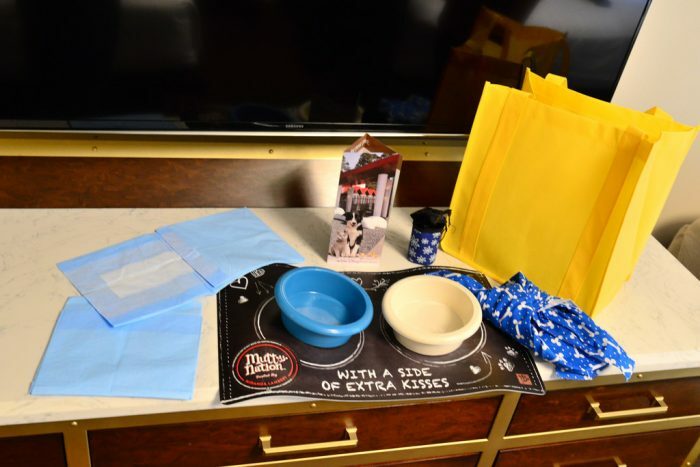 Upon check-in, guests are given “Pluto’s Welcome Kit.” This yellow bag contained a pamphlet for Best Friends Pet Care, two pee pads, food dish, water dish, placemat, bandana, and a pet waste dispenser filled with bags. No food was included. 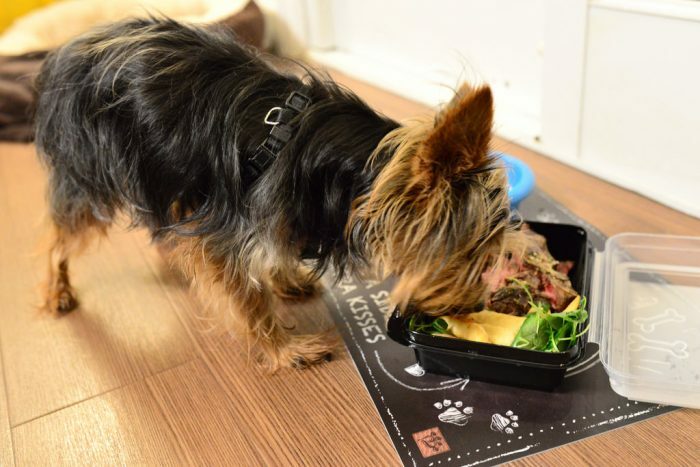 One thing Universal has available as part of room service is a Lowes Loves Pets menu, where you can order dry food, canned food, and even “hot canine entrees” (like I could make that up!) I did not see anything available for pets on the Disney room service menu. One other thing that was included in the Pluto Welcome Kit was this special Do Not Disturb sign that specifically tells Cast Members that a dog is in the room. Here is the Dog Relief Areas map. The location is near the dog-friendly rooms and is directly next to the quiet pool. One of the dog policies is that dogs must be “leashed or restrained” while on property and as you can see in the picture, Sebastian is off leash. Sebastian’s mommy was holding his leach and was never farther than 3 feet away. If another guest had been anywhere in the vicinity we would have immediately put him back on the leash. This is the view from the main Yacht Club door leading out to the quiet pool. The Dog Relief Area is found by following the walkway on the left. The Pet Relief Area map shows two areas labeled, one on the right side of the walkway and one on the left. Here is a view of the area on the right side of the walkway. In the background you can see a container of dog waste bags. Standing at the container, here is a view of the left side of the walkway. As you can see, there is no way your pets can access the grounds from this area. 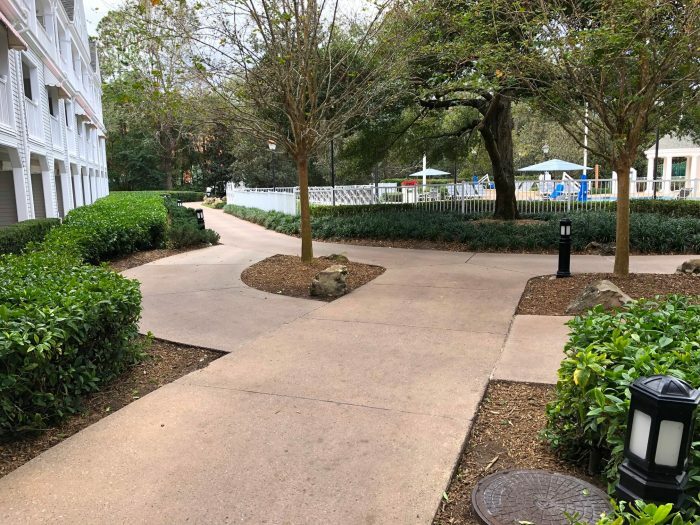 The walkway going to the left in the picture solely leads to a door that is closer to the dog-friendly rooms. Maybe the marker on the Pet Relief map means that the large area in front of the rooms is also an all-access pet relief area. There is no signage in the room or outside saying that you can’t use the large area in front of the rooms, but there is also no designated path to get to it either. 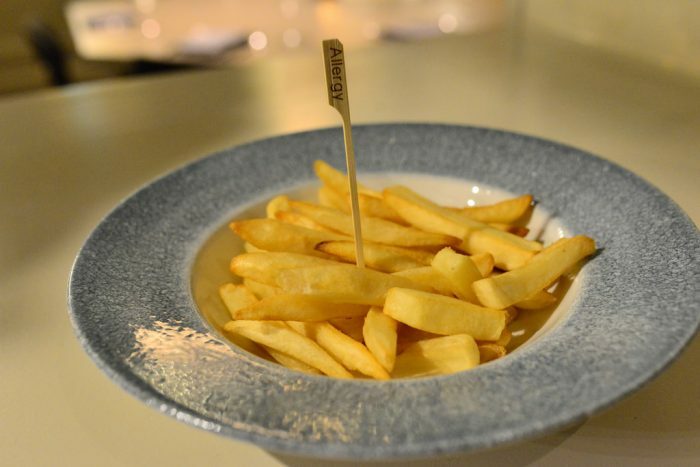 While we did bring dog food for Sebastian, one of the things we wanted to try on this trip was the newly opened Ale & Compass restaurant at the Yacht Club. 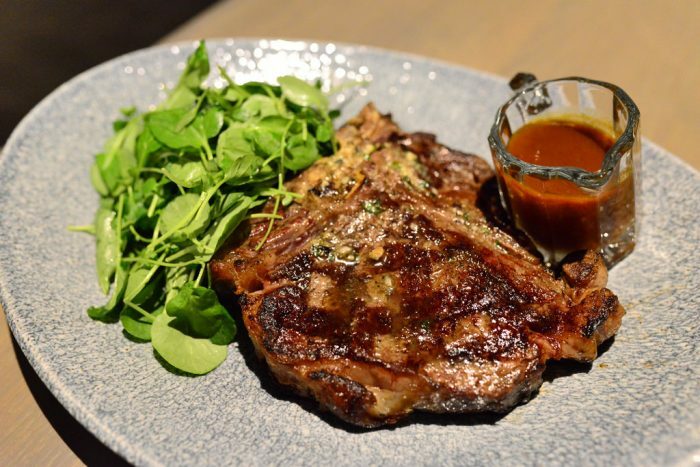 Sebastian’s mommy felt he would like “the 16 ounce t-bone steak.” Yes, you read that right. T-Bone Steak from Ale & Compass. She also ordered him some fries. SURPRISE, he liked it. I think I need to leave a Cast Compliment to the chef, but I’m not sure if I post it on Twitter or Rover.com. We had a great time at the Yacht Club. 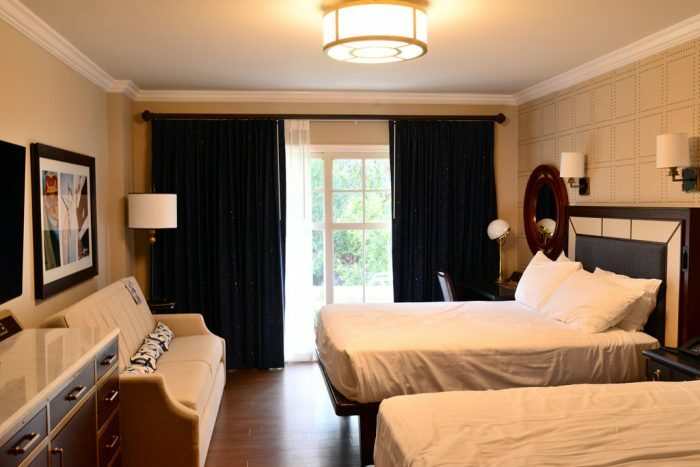 The room was clean and looked tremendous, the staff was exceptional, dinner at Ale & Compass was a big thumbs up (the deconstructed apple pie dessert was a huge hit), and – above all – Sebastian enjoyed his stay. We never encountered any other dogs during our time at the hotel, which is pretty much the same thing we find when staying at Universal. For all the outcry about how pets will ruin the experience at hotels, it truly is Much Ado About Nothing. 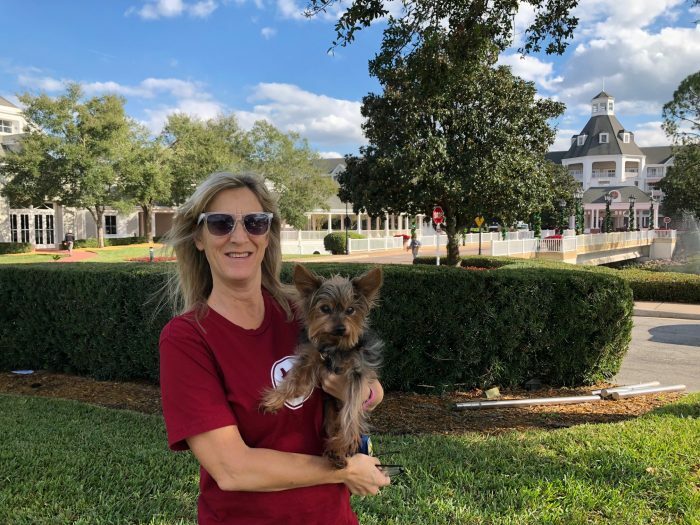 Your odds of having an personal experience with a dog, or being in an area that a dog was recently in, is probably 10 times larger at the parks or Disney Springs (if not even higher) than it is at a dog-friendly hotel. 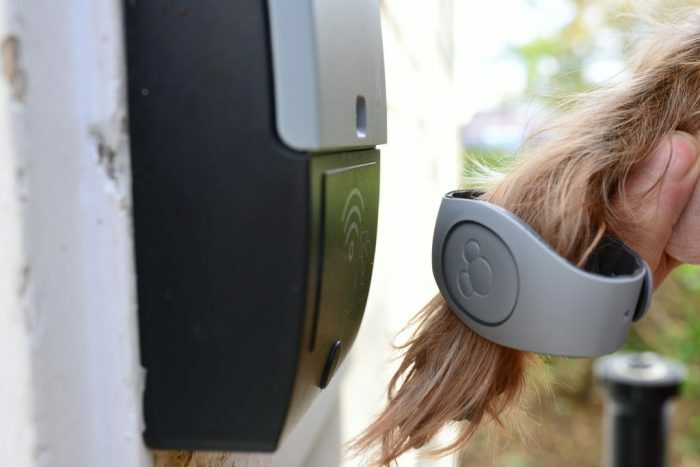 Service dogs, both the real ones along with the increasing amount of fake ones, are now a regular part of the Disney experience, much like strollers and ECVs. You will NOT be put into a dog-friendly room unless you specifically ask for one. The rest of the hotel is canine-free. 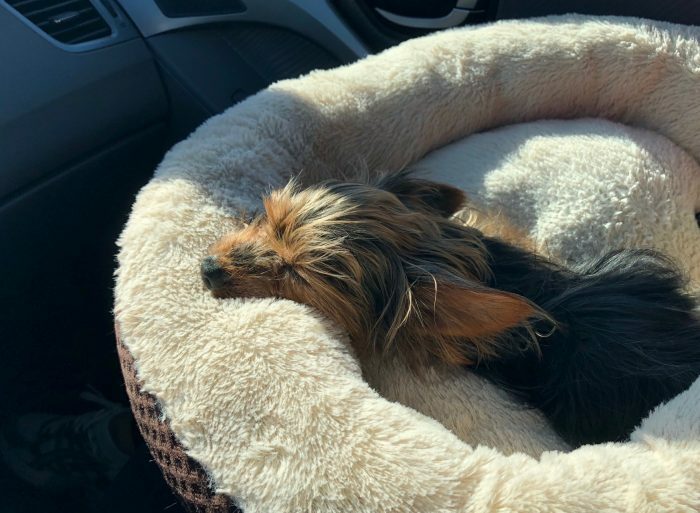 Sebastian was quite content on the ride home, probably dreaming about steak..
To compare prices, for Sebastian to stay a night in an inside standard room at Best Friends Pet Care it costs $44 ($41 if you are staying onsite at Disney.) An indoor/outdoor room is $49 ($45 if staying on-site.) Best Friends will provide food, but you can also bring your own. There is no welcome kit of any kind. I’ve been anxiously awaiting your review. Phenomenal! A few questions: What is the limit for the number of pets per room? What is the weight limit on each pet (preferably in pounds)? There is a limit of two dogs per room. I did not see a weight maximum. Does the dog enter the park itself? Or hang all day in the room or what? Only service dogs are allowed in the parks. I think there is a 7 hour maximum that you are allowed to leave the dog unattended in the room, though of course Disney have no way to measure or enforce this. Dogs can stay in the room, or get dropped off at the Best Friends kennel for daycare. 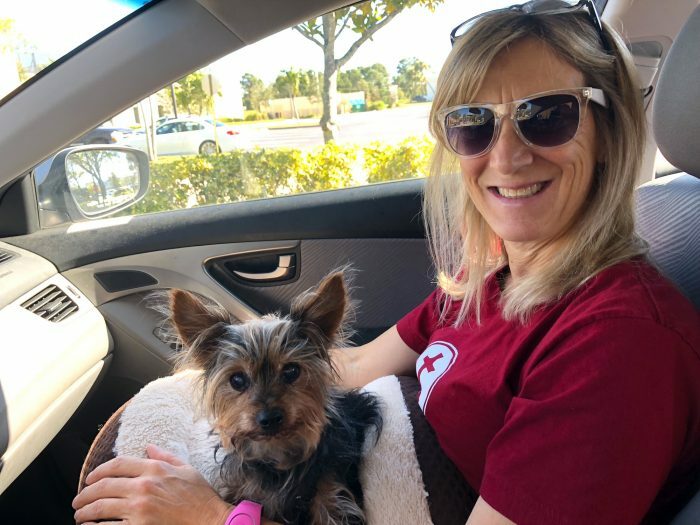 “For all the outcry about how pets will ruin the experience at hotels, it truly is Much Ado About Nothing.” Your short stay in one of the pet friendly resorts is hardly enough experience to justify this statement. Unfortunately, I had a very different experience at Riverside. For the record, I was thrilled dogs were allowed until seeing firsthand how it could possibly ruin the experience for other guests. Yes. I enjoyed reading this review, but Touring Plans should know better than most that it’s risky to draw broad conclusions based on a few good or bad anecdotes. You would really need to survey many more guests to find out how frequently problems arise, and to judge whether the benefits outweigh the costs and whether the policies could be improved. Could you please elaborate? We have a dog (her brother recently passed away) and we always took our RV to Fort Wilderness if we wanted to bring our furry friends. We see a lot of other dogs there. We’ve stayed at Universal and only seen a couple of other dogs during our stay. How was the experience ruined by dogs being at the resort? I’m curious what your negative experience was, too. 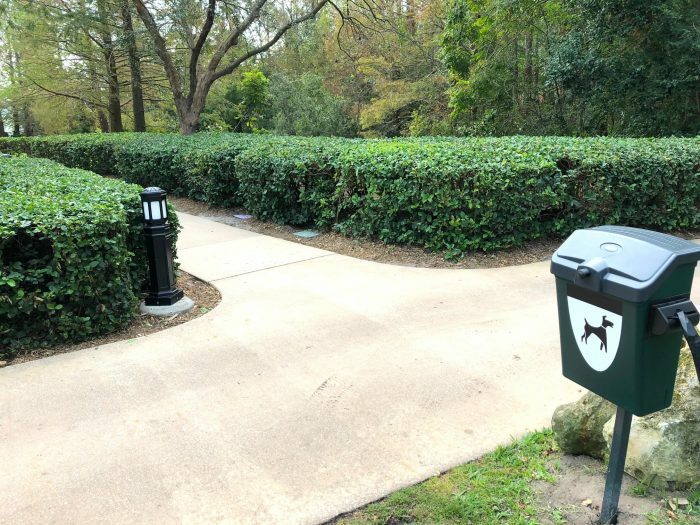 It seems to me that Disney has done quite a bit to distance dog-friendly areas of the hotel from the rest of the resort, so I would’ve thought they’d addressed the complaints about dogs running riot all over the resort and leaving litter in common areas or triggering allergies in rooms previously rented out to pet owners. I agree. This was written from a very specific perspective, and the language used put me off from the start. I own two Sebastian’s and they are great. But I have a problem with allowing my pets to influence perhaps a not so good stay for the next guest who stays in that room I just stayed in. There’s a good chance the the average dog will be experiencing anxiety and be upset and get sick in that room not to mention the shedding and dander that’s created (allergies). After all they are still animals, and that’s why they walk on fours and not two legs. It’s unfair to put the onus on the next guest or the guest next door. If there was a Resort for just animals and their owners then this would make sense, but all’s it takes is for one guest to experience a bad visit due to another guests pet and once that hits the internet Disney will have bigger issues with rumors and guests not returning. Resort stays are very expensive and guests demand top level service. You know the old saying “Don’t poop where you eat”. With all due respect, hotels have been allowing dogs for years. Nice hotels like the Ritz and the Waldorf allow them without this huge kerfuffle. Dogs impact a stay as much or as little as people do. Have crying children woken me up in the morning? Yes. Have youngsters running through the halls seemingly unsupervised bothered me? Yes. Honestly, I have been disturbed by pets almost never. Compared to human travelers’ disteutiveness, pets win. I have always traveled with my dogs and never had a complaint. If you don’t like it, stay at the hotels that don’t allow them. Most do not. This is simple. I have not visited Disney as much as I would like, due to their lack of pet friendly options, and I am going to book a visit soon. It is a small allowance that Disney sees their customers want and is providing. I am thrilled. The entitlement is strong with this one. I’m sure your dog will love it when you bring them to Disney and leave them locked up in the room all day. Truly living the dream. There are dog appropriate places to go on vacation. A location where you’ll be spending 90 percent of your waking time in the parks where you cant bring your dog is not one of them. When we were down there somebody near us had a dog that barked incessantly allllll day. Front desk couldn’t figure out which room it was so they couldn’t do anything. Never had a problem with a baby doing that. The Disney resorts have allowed service animals for years and years without segregating them at all, and it has not impacted anyone’s vacations that I’ve ever heard of. Service animals are subject to long and rigorous training. They are specifically chosen for their temperament and ability to handle stressful situations, strange locations, and distractions. I know a lot of perfectly sweet dogs who have ‘flunked’ service training, because the requirements are stringent. How do we know? Because she freely admits to breaking the rules, because why should the rules apply to her? But don’t worry, ‘mommy’ will put the leash back on if someone’s there to see her. Thanks so much for your review! We have booked a cabin at Fort Wilderness and are bringing our dogs this coming spring. I’m glad to hear it went so smoothly! The reactions this issue gets never cease to amaze me. We bring our dogs (now just one) often to the Fort, though we own an RV. Have NEVER had an issue with other dogs…either at our site, walking them, or at the dog park. And you will encounter dogs on every loop. You mention multiple visits to Fort Wilderness. I’ve stayed in the cabins, but never camped there. Do you have any suggestions for a small party with a humble little tent? Obviously we’d prefer to be away from RVs that would dwarf us. Can you recommend a loop or spot we should ask for? There is a meadow specifically for tent camping, however, you will not have any amenities. If I were tent camping, I would get a partial or full site. Not a Premium as these are fully paved. 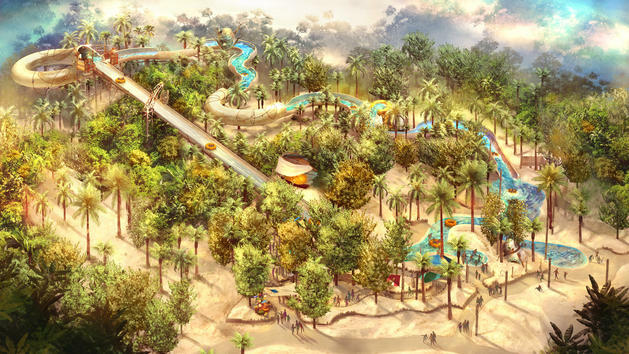 With any other site, you will have a driveway to park on, so your car is at your site, your own water and electricity. You obviously don’t need the sewer but having the other will make your stay easier. You will also have your own bbq grill and picnic table. In the meadow, these are first come, first serve. Don’t feel you will be surrounded by RV’s. 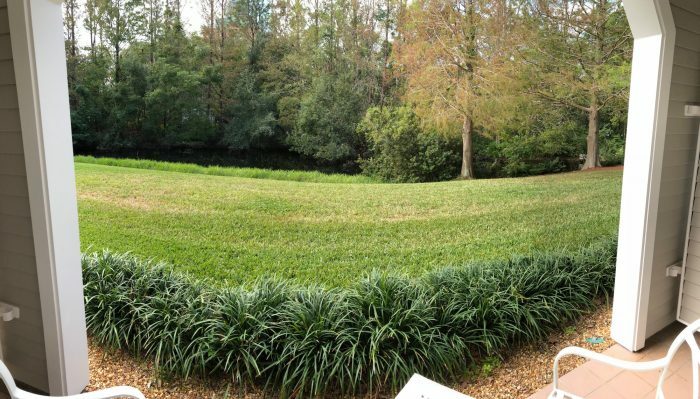 There is decent separation between sites with trees and bushes. Many people who bring RV’s also put up tents. The comfort stations are all withing walking distance and well kept. Don’t worry about what other people are camping in…it’s Disney and everyone is there for a good time. Enjoy! …the only worry is the loud sound many RVs emit all nite, hampering our rest. If the RVs are so prevalent that they are audible all over – which is true in *some* campgounds – we’d skip camping and stay in a hotel. Thanks for the good review. 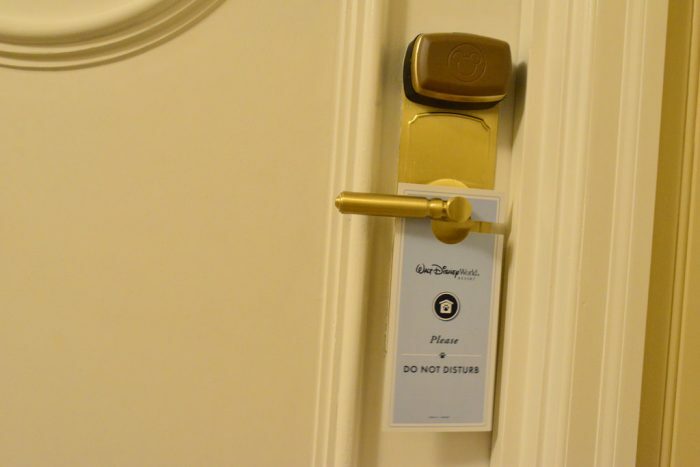 I do have a curiosity question about the “do not disturb” sign in your Pluto kit, which seems to be in conflict with the new Disney policy to replace do not disturb signs with Room Occupied, and their policy change to have a cast member enter each room once per day. While that policy is not yet at all resorts, we expect it to be before long. 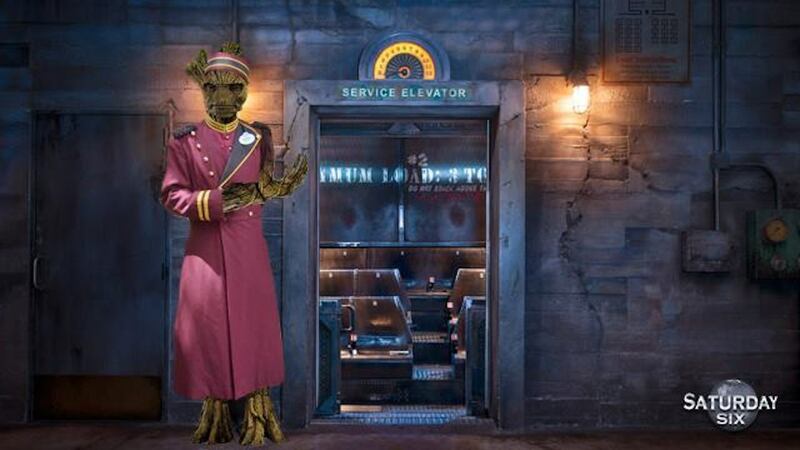 Did any cast members say how that policy would be handled with the rooms that have dog occupancy? I think the Kefuffle that was going to be happening was not just badly behaved dogs but dogs that are left in the room from 8 AM to 10 PM when people go to the parks. How did that get handled? You admit to not following the rules, & believe me you won’t be the only one. An incident is going to happen between two dogs or a dog & a child…& someone is going to get very hurt. Can’t believe they would open themselves up like this after the alligator attack. Terrible idea. For the future, pls be a responsible dog owner & follow the rules you agreed to. This is exactly what I thought of too. My dog is perfect so it’s ok if I don’t follow the rules. Funny thing is that is how many pet owners feel and the exact reason why so many guests don’t want pets at the hotels. We have to echo Kelly’s comments. No matter where we go where dogs are supposed to be on a leash (beach, public parks, etc), we normally see a least one, usually several dogs off-leash. While we don’t see a dog the size of Sebastian as any sort of threat to us, we often see much larger dogs off-leash, dogs which could do serious harm. When called on it, dog owners invariably say “my dog isn’t aggressive”. Yeah, right. I’m sure the woman who was recently killed and partially eaten by her pit bulls thought that too, right up to the point they attacked her while she was walking them. If you can’t follow the rules, don’t bring your dog. Period. Totally agree. Too many owners feel that their dog is an exception to the rules and regulations and therefore not subject to any of them. If a simple rule like “leash or restrain” or your dog is so easily and casually broken, it is laughable that Disney thinks its other rules (like “you will be called to address the noise within 30 minutes”) are somehow enforceable. Thank you for highlighting the leash portion of this review. This can be a really serious issue. People are absolutely crazy about their own dogs and can develop strong blind spots. Sebastian may be the best dog ever, but there are random things that happen in a Disney environment: a firework or loud noise might suddenly scare him and cause him to run off. There are guests with dog phobias and allergies who don’t want to be surprised. There are alligators and poisonous snakes all over the resort just waiting for nice snacks. Please people, (and I include my dog loving self) KEEP YOUR PETS LEASHED ON PROPERTY. “There are alligators and poisonous snakes all over the resort”…..I am amazed we all survive a single day there!! You’re making fun, but the fauna at WDW can be dangerous for dogs; especially the ones of Sebastian’s size. I’ve encountered gators and snakes (and, yes, bunnies and mice and ducks) just walking the trails. And (sadly) not everybody has recently survived with the alligators. They can be dangerous. I think the point still stands that leashes are a good idea. Exactly my thought as I was reading and saw the dog was off the leash. Disney can have all the rules in place they want, but if people don’t follow them, what’s the point. Just because a dog may be well behaved at home, doesn’t mean they will be a Disney where there can be a loud noise or a screaming kid or a running kid, pop up in the blink of an eye and unexpected and the dog take off. I don’t believe there is any fear from this dog, but other dogs . . . yes. And no matter the size, some kids (and adults) are terrified of them and have allergies to them. No matter how close, if a dog got startled and took off running, the owner wouldn’t be able to catch them. I think Disney made a huge mistake with their dog policy at hotels. First, Ditto Kelly. Second, I actually stopped reading after I saw the photo of the dog on the bed. While I can appreciate others’ love for their animals, I don’t see how they can expect other’s to share it. I for one don’t want to sleep where a dog has been, That just grosses me out and I feel very disrespected by you allowing your dog on the furniture. If you want your dog on your bed, that’s your business and I have no right to judge, but let’s be clear, that’s not your bed. That’s why I’m NOT happy with the new policy, because others will not see their actions as an imposition on other people, as clearly seen here. These rooms are designated ‘pet friendly’, but that doesn’t mean only guests with pets will be staying in those rooms. Disney wants to fill them with or without pets. 1. Rooms set aside for pets will NOT be given out to other (non-pet-owning) guests. 3. Pets must be on leash in public areas. As long as they stand by these policies, there should be no issue. Unfortunately, policies are not in place to manage poorly-behaved children (with entitled parents) and drunk college students. So far, those are my only negative experiences on Disney property. Well, I’m a little late to this post but I just gotta say. Derek, I love ya, you write my favorite articles on this blog… but this article is off the mark. 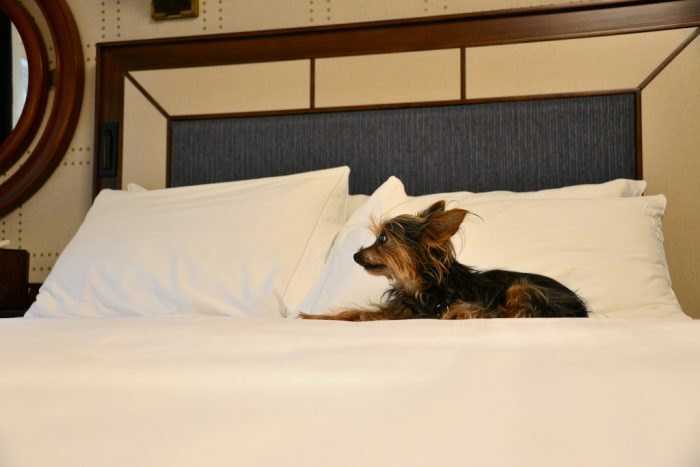 “For all the outcry about how pets will ruin the experience at hotels, it truly is Much Ado About Nothing.” Oh really? It’s clear that *your* experience (as a dog lover bringing his dog to the hotel) wasn’t ruined, but how can you speak for everyone else? Others have commented on this already, but may I reiterate, your willingness to break the rules right off the bat is exactly why people are opposed to this new policy. We who don’t own dogs have pretty strong insight into the fact that the vast majority of dog owners are 100% blinded by their love for their dog. Too many assume everyone else will love their dog; too many assume no one else minds their dog’s behavior. 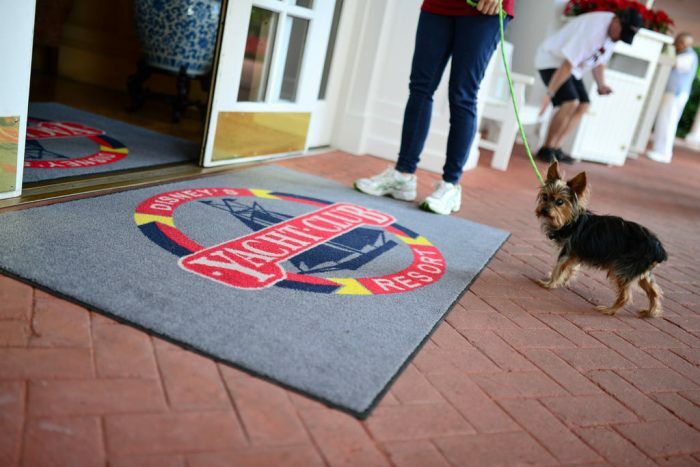 As it happens, my family will be visiting Yacht Club later this month; part of the reason we like Yacht is because it has a more sedate, lower-key atmosphere than many other hotels on property, which works well for an autistic member of our family. That family member also happens to have a fairly strong fear of dogs, so we were a little blindsided by the sudden implementation of this new policy. We’re going ahead with our booking, but with trepidation. I sincerely hope other dog owners at the hotel know how to follow the rules.